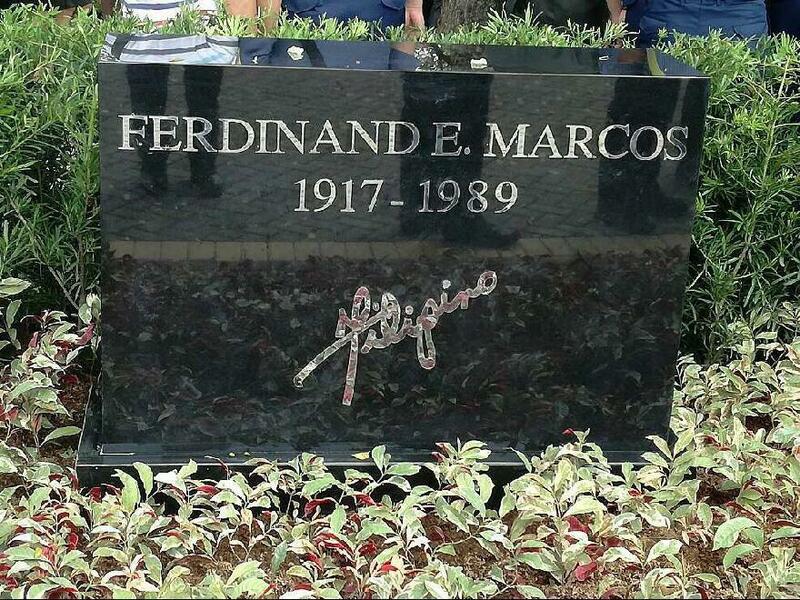 The remains of the late President Ferdinand Marcos have been buried at the Libingan ng mga Bayani. The burial took place at noon Friday, after the body was flown from Laoag, Ilocos Norte late Friday morning, apparently only hours after a decision was reached on the matter. The remains arrived at the heroes’ cemetery past 11:30 a.m., with burial rites conducted shortly after. Confirmation of burial was made public only at past 10 a.m. by the Philippine National Police. National Capital Region Police Office chief Dir. Oscar Albayalde said they met with Ilocos Norte Gov. Imee Marcos on Thursday night, where they were informed about the decision. Military spokesman Colonel Edgard Arevalo said “the will of the Marcos family” had to be respected after they requested a simple, private ceremony, Reuters reported. Video taken from the gates of the cemetery showed the late dictator’s children, Bongbong and Irene, and others walking behind the hearse that carried the coffin, draped in the Philippine flag. Victims of human rights abuses during the Martial Law regime, meanwhile, condemned news of the hastily-organized rites. Boni Ilagan, an activist who fought the Marcos dictatorship, compared the surprise burial to the declaration of Martial Law in 1972. “Like a thief in the night, Marcos declared Martial Law in 1973. Like a thief in the night, he is being buried today. It is the Marcos style all over again.” he said in a statement. Ilagan enjoined everyone to join mass protests scheduled all over the country on Friday in response to last week’s Supreme Court decision allowing the burial to happen. Friday’s burial, backed by no less than President Rodrigo Duterte, comes 10 days after the Supreme Court ruled to dismiss the consolidated petitions seeking to stop it, voting 9-5-1. In its decision, the High Tribunal said there was no law prohibiting the burial at the heroes’ cemetery, despite allegations of rights violations and corruption against him. Duterte knew about the burial of late former President Ferdinand Marcos on Friday, according to Philippine National Police chief Dir. Gen. Ronald “Bato” Dela Rosa. “Alam niya. Alam niya iyan. Hindi naman siya maba-blind. Wala naman tayong special attention dito,” Dela Rosa said in an interview with reporters. Duterte left for Peru on Thursday to attend at the Asia Pacific Economic Cooperation (APEC) Summit. The President had earlier said he would allow the burial as part of his campaign promises. On November 9, Duterte in a press briefing said that he gave former Senator Bongbong Marcos the go-signal to proceed with the burial. Marcos was accorded military honors, including a 21-gun salute. There was also a flower drop.